Unlike many other innovative and technology driven watch brands out there, Tissot has a rich history starting in the year 1853 in Le Locle, Switzerland. This enables them to use their historic designs, craftsmanship and experience as valuable input for new and innovative timepieces. During their +150 years of watchmaking, Tissot introduced various groundbreaking timepieces including the first anti-magnetic watch in 1933, a navigator watch with 24 time zones in 1953, concept watches in the 1970s like the all plastic IDEA 2001 mechanical watch and the rock watch, created from granite from the Alps. Younger watch adepts might recall Tissot’s impressive T-Touch watch, including a superb working touch screen, far before the iPhone and Torch were introduced. 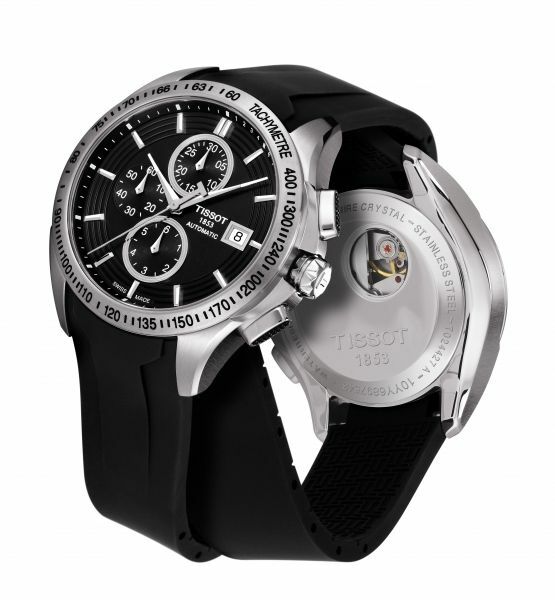 In Tissot’s T-Sport collection, we find the impressive looking Veloci-T automatic chronograph. A stunning 42mm sports watch that has been built with the same care, precision and craftsmanship as all other Tissot sports watches. The superb quality Veloci-T sports watch immediately will make you think of racetracks and burning rubber. The black dial has this circular grain with metal applied hour markers and a metal date window on top of it. Inside the circular grain on the dial, there are three sub dials. The chronograph’s hour and minute totalizers are located at 6 o’clock and 12 o’clock and the regular seconds hand at 9 o’clock. With the pushers (with black inserts with a hobnail pattern) you control the chronograph’s centered large second hand. The metal rings around the upper and lower sub dials and the tachymeter makes this watch perfect for on or near a racing track. During more quiet moments, you will be able to enjoy the mechanical automatic chronograph movement when you turn the watch around. A peek hole in the upper right side of the stainless steel case back shows you that the balance wheel does its job correctly. A great and refreshing way to demonstrate the craftsmanship of today’s watchmakers and still keep this sports watch to be very pure. Available on a rubber strap with folding clasp and a stainless steel bracelet, this watch is suitable for all occasions. It makes the Veloci-T suitable for an active outdoor life as well as with your finest business suits. The sapphire crystal protects the watch against scratches from sharp objects and together with the stainless steel case construction; it’s water resistant to a pressure of 10 bar (or 100 meters). 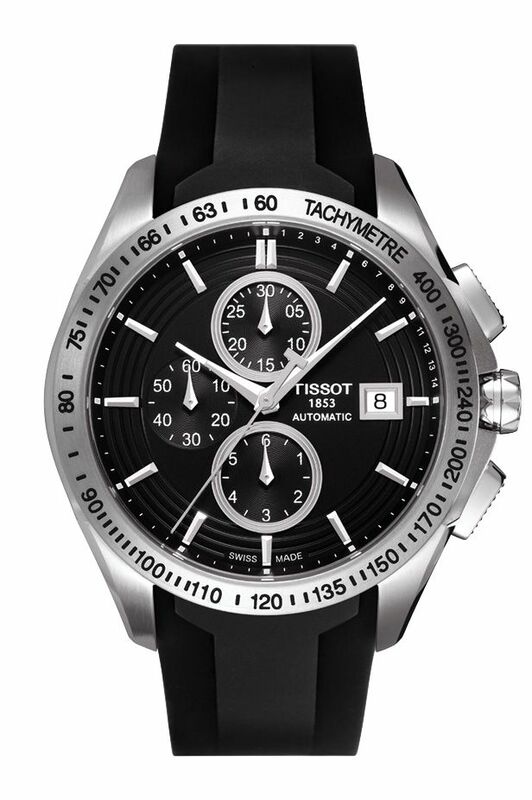 The Tissot Veloci-T automatic chronograph retails for $895 USD.